I’m one of those people who crave salads year round but now that it’s summer, I find myself having one a day. I try to keep it interesting using different greens, proteins and salad dressings and this particular salad is one that I’m enjoying lately. 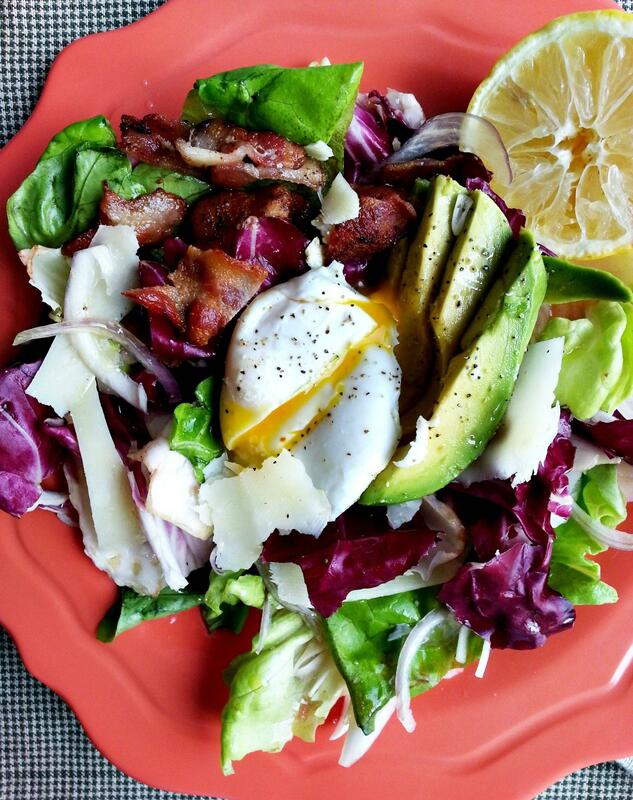 This market salad with bacon is a twist on the market salad sold at the Hungry Cat in Los Angeles. It’s one of their most popular salads that’s so simple but so darn good. 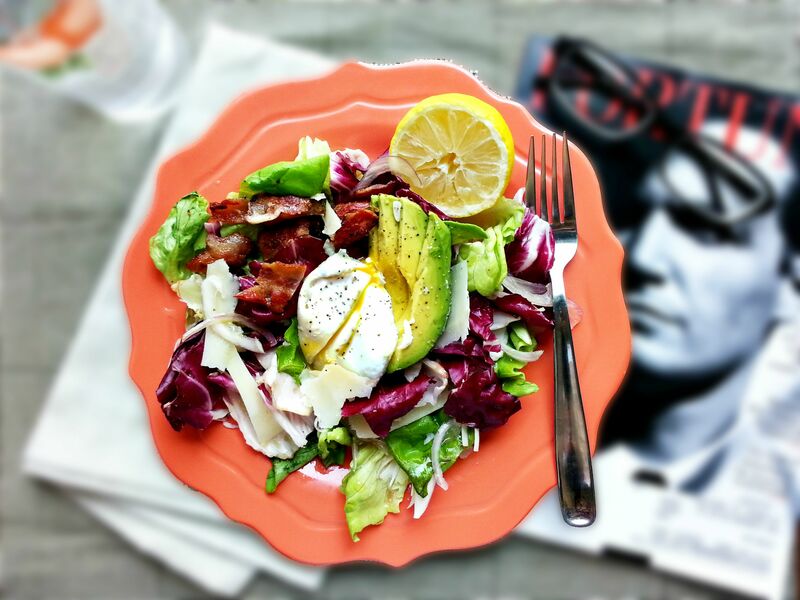 The Hungry Cat’s salad has a mixture of lettuces with sieved eggs, shaved Pecorino, avocado and shallots all tossed in a lemon vinaigrette while my version has radicchio, Boston lettuce, a poached egg, shaved Pecorino, avocado and bacon all tossed in a lemon vinaigrette. Either way, they both are light, refreshing, and delicious! Whisk together lemon juice, olive oil, salt, and pepper in a medium bowl. Set aside. Fill a shallow saucepan with no more than an inch of water. Bring to a simmer but not a boil over medium heat. Add the vinegar to the water. Crack the eggs in a small bowl. Carefully drop the eggs one by one into the water, nudging the egg whites closer to the yolk to help keep the egg whites hold together. Turn off the heat and cover the pot. Let sit for 7-8 minutes for runny eggs, or longer depending on the desired degree of doneness. Remove eggs with a slotted spoon and keep warm. Meanwhile, heat a medium saute pan over medium-high heat. Add the bacon and cook until crispy and browned. Remove from heat and drain on paper towels. Crumble bacon into large pieces. Separate Boston lettuce leaves and radicchio leaves. Place in a large bowl with the avocados and shallot. Add half of the dressing and toss together. Portion the greens onto four plates. 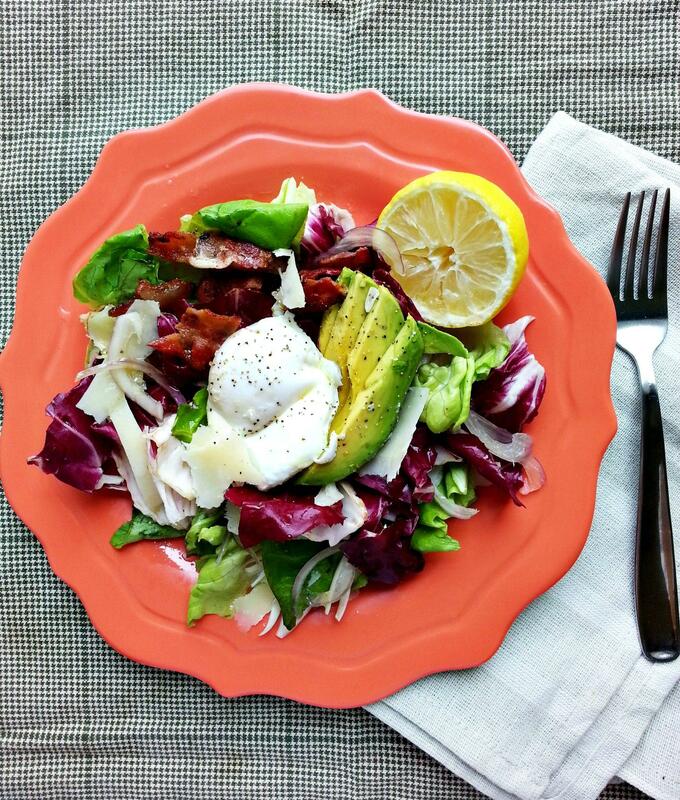 Top with bacon, poached egg and shaved Pecorino cheese. Drizzle extra dressing on the salads. Serve. One of the great things about this market salad is that you can easily adapt it according to your preferences. Vegetarian? Take out the bacon and substitute with some chickpeas. Not a fan of bacon? Put shrimp, grilled chicken, or beef instead. I made my vinaigrette with more lemon juice because I love the tart, fresh quality of the lemon. When poaching eggs, keep in mind that if you are only poaching 1 or 2, they will cook quicker. The bigger the batch, the quicker the heat will be absorbed, thus the longer they take to cook. Always add lemon juice or vinegar to help hold the eggs together and use the freshest eggs! The original market lettuce salad didn’t include radicchio but I love the bitterness that it gives to the salad. The creamy avocado with the sharp Pecorino paired with the tangy vinaigrette and bitter radicchio all play perfectly together. It’s no wonder this salad is such a hit at the restaurant. I can’t wait to make this salad again for lunch tomorrow! I'm so glad you visited Neighborfood because it gave me a chance to discover your blog! You have some amazing pictures! Can you come give me a workshop?? I am just dying over the perfectness of that poached egg. 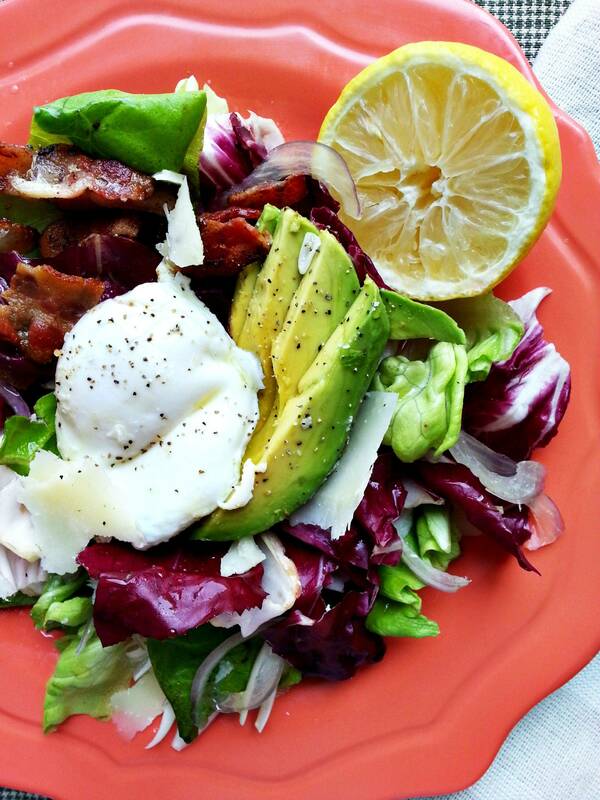 There's nothing like the creamy yolk to make the perfect dressing for the salad!